Been busy testing some things lately. It is now time to document the lessons learned. Late 2016, Hackaday ran a 1kB coding contest. I don't remember the thought process that got me there, but an idea was born. Implement a numbers only Enigma Z30 machine in 6502 code running in a KIM-1 emulator. The finished product is shown below. The barebones, enigma only machine was 460 bytes. When code was added to change the machine settings without exiting the program, it grew to 703 bytes. Adding 150 bytes for the Kim-1 ROM keyboard and display routines brings the total to 853 bytes. A 2010 article by Arturo Quirantes about a machine that was offered for sale to the Spanish government, shows a couple of pictures of a closed machine and provides a sequence of numbers and the encrypted output but no settings. Upon closer examination, the Wik and Quirantes papers show two different machines. Both show a machine with 4 rotors, 10 keys and 10 lamps. The machine in the Quirantes pictures has the arrow on the power selection switch point away from the keys. The Wik pictures shows the power selection switch points towards the keys. There is a lever in the top left corner of the machine in the Quirantes photos. This lever is not there on the Wik pictures. The Wik paper shows a machine with lever stepping. Pictures of the rotors are shown and they have the notches needed for lever stepping. The article also states that the machine period is 8100 and that the machine suffers from the double stepping anomaly, detailed examples are given. The machine serial numbers are Z101, Z102 and Z103. The Z155 has a 4 position power switch, with similar labels to the Enigma G: heil, dunkel (dkl), aus, sammler. The Z101 lacks the sammler position. The battery locking bolts are clearly labeled 15 in the cryptomuseum Z machine pictures. The battery terminals may be identified as 16. The position of the three pair of contacts that the power switch bridges appears to be rotated 90 degrees on the Z machines. Other parts appear to be in the same position. Most importantly, the Wiks paper provides the rotor and reflector wiring. A machine using a lever stepping mechanism was implemented and the complete key space searched. This was implemented before carefully reading the Quirantes paper and noticing that machine uses a gear stepping mechanism. Amazingly, a lot of 70% matches were found. 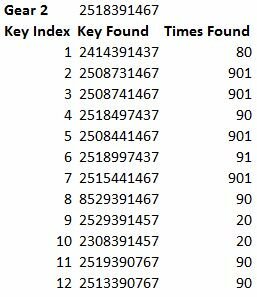 Each solution is given a key index and a count of how many times it is found in the key space. 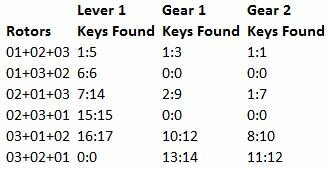 The table at the bottom shows what keys were found in a particular rotor combination. Each solution found was unique to the rotor combination that produced it. No 70% matches were found in the key space for rotors 3,2,1. Some rotor combinations only produced the one partial match. The particular machine settings that yielded the results shown below are not displayed here. The full results are available in the links below. The Enigma Bombe was reconfigured for Gear Stepping, this does not suffer from the double stepping anomaly, where the machine counts: 0089, 0090, 0101 and instead works like a car odometer. This yielded the most exciting results. Solution 1 was the only one found in the key space for rotor combination 1,2,3. It appeared 80 times with different ring settings and starting rotor positions. This table shows with solutions were found for each rotor combination. With a lever stepping machine, each solution was unique to that rotor combination. When the gear stepping mechanism was implemented, rotor combinations 1,2,3 and 2,1,3 encoded an input sequences to the same result. A 100% match could not be found either with the original flawed stepping, lever or gear stepping. With a partial match algorithm, set to accept a maximum of 3 errors in a 10 number key, only 70% matches were found with both the lever and gear stepping. The original flawed interpretation of the stepping mechanism affected by the ring setting did not yield a 70% or higher match. There is a lot of duplication in the key space. 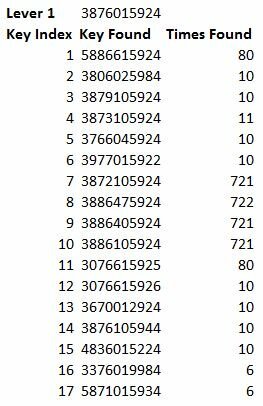 A 10 digit string was encrypted to the same 10 digit result with many different machine settings, the same result was found up to 721 times with a lever stepping machine and 901 times with a gear stepping machine. Generally, a solution was unique to a rotor combination. Gear 1 run, with input 2518391467, solutions 3075015904 and 3675015904 were found with rotors 1,2,3 and 2,1,3. Any of the partial matches found with the lever mechanism were not found in the geared mechanism search and viceversa. A 70% match found in a particular stepping mechanism was unique to that stepping mechanism even though the rotor number sequences generated by both stepping mechanisms produce a lot of common sequences. Assuming credible transcriptions errors would be 9-4 2-1 7-1 0-8 5-6 did not seem to find a key were all the errors are with numbers that can be confused. Future work might involve taking replacing a single number in either the clear text or the encrypted output and re-running the search. This is a lot of cpu cycles, so running it in a faster platform is a good idea. I've got to hand it to you AE, you have thought/tested this through quite a bit. It is a shame there isn't better documentation on the Z model! I was tempted to try to implement it and am still thinking about it. Did you produce the spreadsheet that I found on the web? When I download it, it has no macros to perform the stepping. The Enigma Z has been a fun project. It is amazing to try to reconstruct the workings of 60+ years old mechanism that was almost lost to time.There is a certain sense of responsibility in trying to get it as accurate as possible with the available knowledge we have of the machine. There are no other reference implementations or samples of clear and encrypted text that can be used to verify its accuracy. With those operational assumptions, a paper model was created to visualize the signal path through the rotors. That had to be created first, otherwise it is very hard to be sure the 6502 code is producing the right result. The excel file does not have macros. Macros are trouble... It shows the next value of the rotors based on the stepping rules. 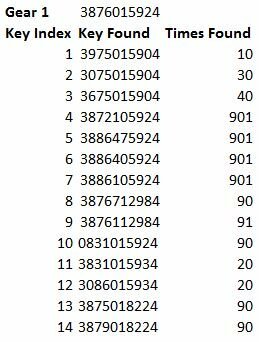 User has to manually copy the value shown to the current rotor positions. The next rotor values change in real time so the desired value has to be remembered when entering it. Seeing the code produce partial matches was kind of exciting. It seems some of the assumptions are not totally off base. There may be a transcription error. The Kim uno code has been updated to have lever and gear stepping. The matches found by the Arduino sketch can be verified by hand wih the Kim. To get it to do gear stepping, memory location 4F has to be set to 1. A menu is coming up shortly.